The Raghavan Committee Report(appointed by MHRD as per the Supreme Court’ order, in 2007), suggested some major recommendations on anti-ragging interventions by educational institutions to curb ragging. The committee was formed post SC’ hearing on SLP No (s) 24295 of 2006 University of Kerala Vs Council, Principals’, Colleges, Kerala & Ors (with SLP(C) No.24296-99/2004 & W.P. (Crl) No. 173/2006 and SLP(C) No.14356/2005). Some suggestions from the report are as following. 3) ragging should be considered an important factor in accrediting the educational institution by central regulatory bodies like the MCI, AICTE, DCI etc. 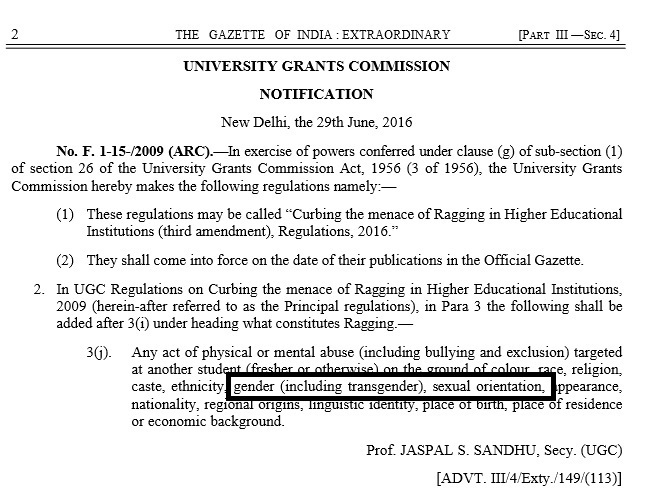 Nine years later UGC has updated its anti-ragging policy, in June2016, which got inclusive of Sexual Orientation and Gender Identity. ‘Had the Universities in Kerala, equipped their administration with the updated anti-ragging policy, students like me who face any form of ragging/discrimination on grounds of Sexual Orientation and Gender can submit complaint. If educational systems fail to address such issues, the students who belong to the sexual minorities stay totally invisible in campuses, unlike our heterosexual peers, and stay depressed’ says Manish* (anonymous name), a law student, from Ernakulam . ‘I felt joyful when came to know about the amendment (2016) of UGC anti-ragging policy. With the thought to present insights on some common issues faced by LGBTIQ students in campuses, I shared the information update to the student union representatives at my college. Instead of any warm response, I was faced curious gestures on why I shared the news, followed by the immediate query, are you gay? Having had a few close friends, whom are politically leaned and expressed solidarity for the sexual minorities, I considered it important to declare my sexual orientation. “My expectations went the wrong way, as none of my friends from the college were open to listen to my emotions but passed lewd comments. I also realised that the college has not adopted the update in UGC anti-ragging policy”-adds Manish. Queerala has checked the status(as per information from Univ websites and informal enquiries with Univ administration) of whether Universities in Kerala, has updated the 2016 order of UGC and here is the comparative chart. 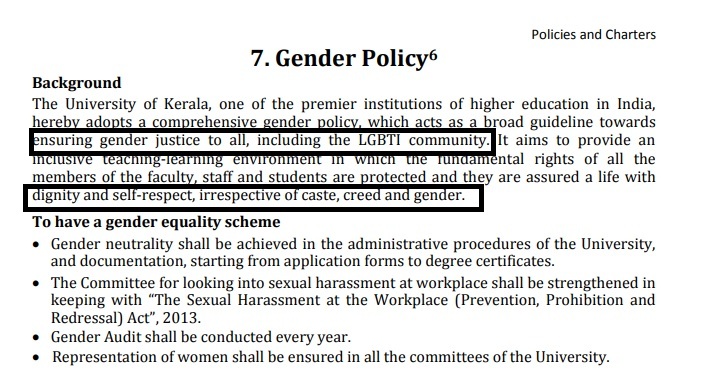 Kerala University, also has, included special mention on LGBTIQ, as such, as part of the 15 policies drawn to ensure Internal Quality Assurance (IQA). The report (Page 11, Chaper7) by the IQA Cell a chapter on ‘Gender Policy’, as part of its vision on Inclusive teacher education systems and academic spaces mentions dignity and self-respect irrespective of caste, creed and gender but misses sexual orientation. The latest gender audit report available for Kerala University and Calicut University, respectively dated 2015 and 2014-15 has considered only the binary gender options, though the state transgender policy was formulated in 2015. We hope the upcoming/next gender audits of each university go inclusive of transgender identity/gender diversity too. We, as a support group believe that each university can initiate such forms of implementation of Transgender policy and there by accommodating, transgender students too, rather than only expecting specific forms of state initiated programs for the gender minority students. If this circular is effectively followed with the latest UGC guideline, more colleges can address issues pertaining to LGBTIQ students. 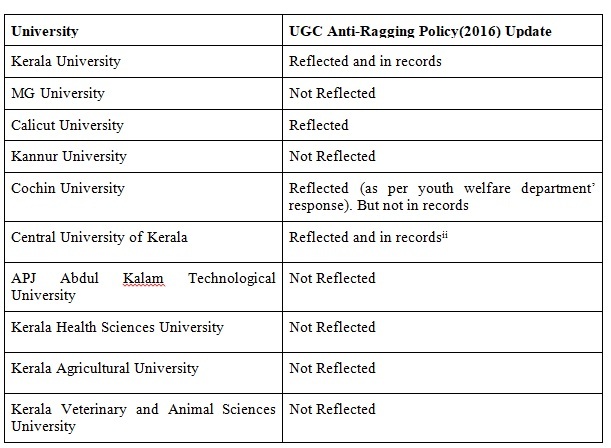 The annual anti-ragging campaign report (2016-17) by CUSAT also misses mention on the UGC update while the Director of Dept. of Youth Welfare, Dr Baby P.K says ‘Our University has followed the UGC update and included the same in the training programs organised in the campus. We would definitely be amending the existing report to reflect the 2016 amendment of anti-ragging policy and seriously consider tracking complaints owing to Sexual Orientation and Gender Identity’. Another possible form of inclusiveness lies in the scope of amendment of the ‘THE KERALA PROHIBITION OF RAGGING ACT , 1998’. A major hope lies in the handbook , by AICTE, for the approval process of new higher education institutions. 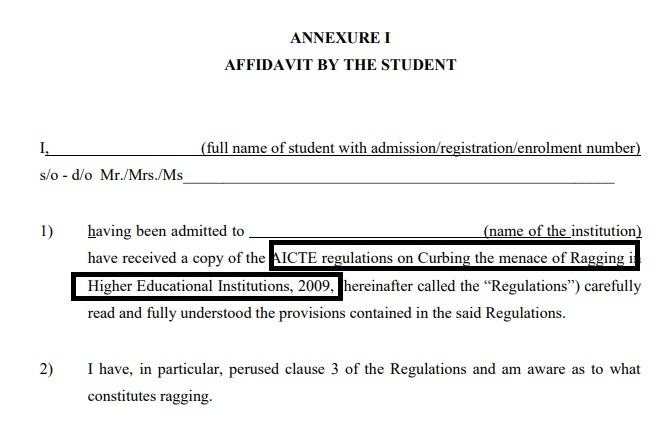 As per Appendix-12, of the 2018-19 handbook, AICTE approved technical education institutions have to comply to the anti-ragging regulations, by AICTE. 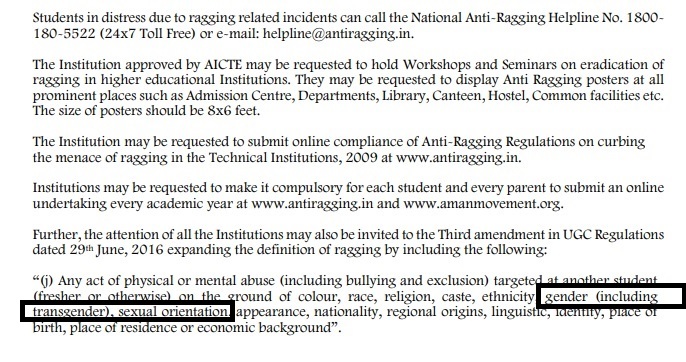 This anti-ragging regulation by AICTE, which is reflective of the third amendment of UGC anti ragging policy dated, 29June2016, not only mandates to hold anti-ragging workshops but also invites institutions to expand the definition of ragging as per UGC update. 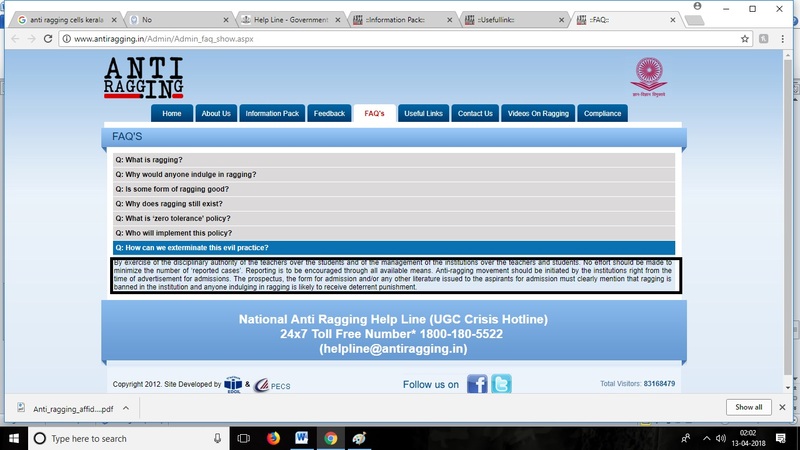 While the anti-ragging notification of some professional institutions mentions homosexual assaults/unnatural offences under types of ragging, the respective institutions have not updated their anti-ragging measures as per the UGC update in 2016 but follows the old 2009 UGC anti-ragging regulation. Opting the amendment is important to address violence discrimination faced due to Sexual Orientation and Gender Identity. This is different from physical abuse form of ragging(to address which homosexual assaults, unnatural offences clauses are used in the ragging prevention guidelines in some institutions). Even though a few Universities, in the state has adopted the amended UGC guideline, hardly a college under these Universities has shifted, the institutional guidelines for ragging, from the 2009 version of anti-ragging policy. This also stays as a hindrance for the policy not getting reflected in the anti-ragging affidavit, which individual colleges deploy for agreement from students and parents(Below given are two examples of such an affidavit from a govt. 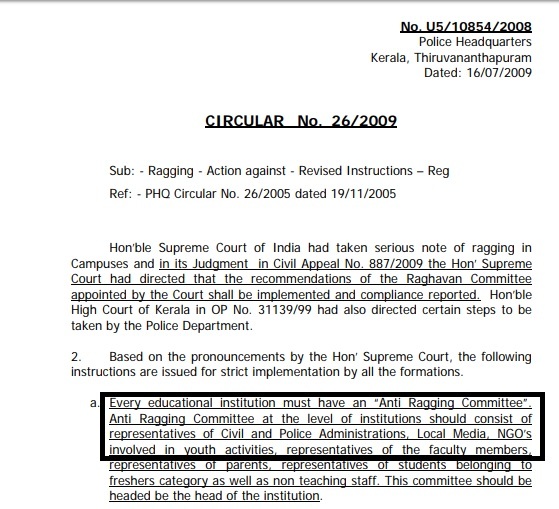 College, in Kerala and anti-ragging measures’ description from a govt medical college, respectively). While AICTE has approved UGC update Medical Council of India still has not reflected the same. The national anti-ragging committee also suggests all institutions to mention anti-ragging movement’ information on every advt. of the institution, admission prospectus and any literature issued to participants during time of admission. If all this prospectuses and official documents of colleges get updated with the 2016 amendment, it shall add to Inclusion. The anti-ragging committee in every college, as pronounced by the Supreme Court of India, can make use of services by Community organisations and collectives which work for LGBTIQ rights, as per the circular given below. This shall also let campuses to seek help from LGBTIQ groups to hold anti-ragging campaigns in the given area of enquiry. Bullying and discrimination faced by gender non-conforming and transgender students often don’t get reported under ragging.. The absence of LGBTIQ support groups in Kerala campuses, except ‘Coming Out’ and ‘Umeed’ respectively in Central University of Kerala, Kasargod and IIM Calicut adds to hardship of students who are LGBTIQ. Given the uneven legal support for the human rights of the sexual minorities, we strongly urge all Universities and heads of all affiliated colleges in Kerala, to equip educational institutions with SOGI (Sexual Orientation and Gender Identity) Inclusive anti-ragging policies, valuing human diversity and prohibiting discrimination based on SOGI. While students who are currently studying in colleges and universities in Kerala might not be able to register complaints of ragging under sexual orientation and gender identity, implementing the update on UGC guideline against ragging shall definitely be a step towards creating safe spaces for LGBTIQ students in the state. 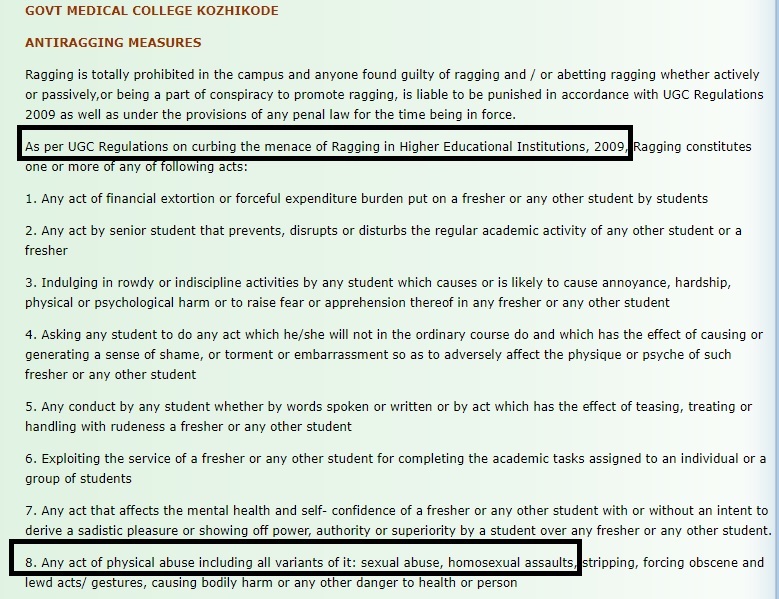 Even a poster of the updated anti-ragging policy, in colleges, would be a great start! anti-raging act, gender identity, Kerala, ragging, sexual orientation.